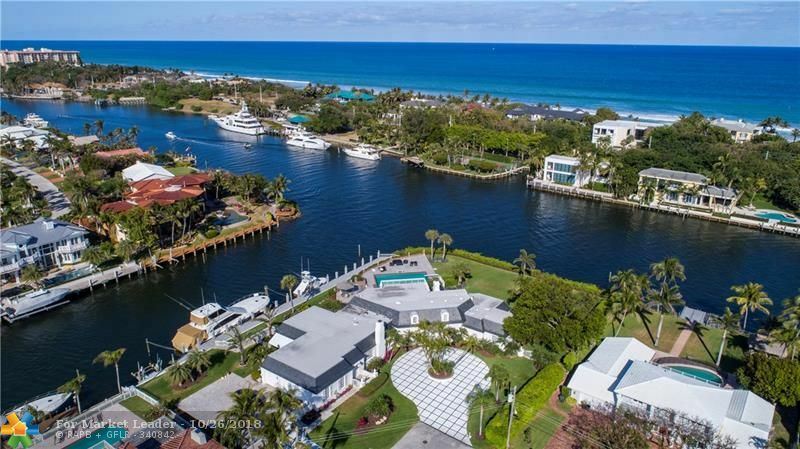 Gated Intracoastal Point Lot Tennis Compound sited on 1.62+/- acres and 465+/- feet of wraparound waterfrontage facing the mega-mansions of Hillsboro Mile. Monumental South Florida waterfront estate featuring a Palatial Main House with 6-bay garage and two separate guest houses all surrounded by verdant gardens. Resort-style amenities include a lavish sun-splashed pool, Entertainment Pavilion, Fitness center, lighted tennis court, and sand volleyball court. Over 15,000+/- SF with a desirable first floor master wing and dual luxe master bathrooms. 200 +/- feet of protected side yacht dockage minutes to the Hillsboro Inlet for the avid boater. Shown by appointment only to pre-qualified buyers only. NEW SE Point lot Home on a Premier Quiet Street AKA The Best Lot in Lighthouse Point. 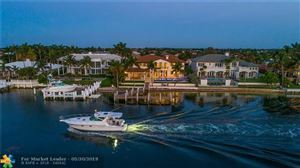 Bring your Yacht to this Resort Style Coastal Contemporary Home on 240' Dockage w/panoramic Water Views.Hurricane Built & Minutes to Hillsboro Inlet.This Spacious Home Complete W/ 10' High Impact Sliding Glass Doors Opening to a 60' Long Covered Loggia w/ full Outdoor Kitchen & Gas BBQ. Ensuite Bedrooms W/ Slider Leading to their Own Private Patios. Hardwired Alarm, Built in Sound System, Camera System & HD TV Wiring. Full Home Generator & Hybrid Water Hater. Custom High-End Kitchen Cabinetry W/ Wolf & Subzero Appliances,Formal Casual Dining Areas. 54' Long Smart Technology Resort Style Salt-Water Lap Pool W/Sunken Spa& Full-Length Sun Shelf.4CG, Clubroom W Full Service Sit Down Bar & 2 Wine Coolers. $500,000.000 PRICE ADJUSTMENT...BRING OFFERS! In a class of it's own!! This premier custom Coastal Showplace w/ 100-ft d/w, directly on the No Wake Zone of the ICW on Lighthouse Point's Millionaire's Row, sits regally on over 19,000 sf. of land! Built by Summit Homes w/ interior finishes by Lighthouse Interior design team, the perfectly designed floorplan provides 5 Beds/6 baths*club room* upstairs loft/bonus rm*elevator*3 CG. With almost 2000 sf of covered patio/ balconies, this home boasts a summer kit,oversize pool w/tanning shelf & infinity spa. 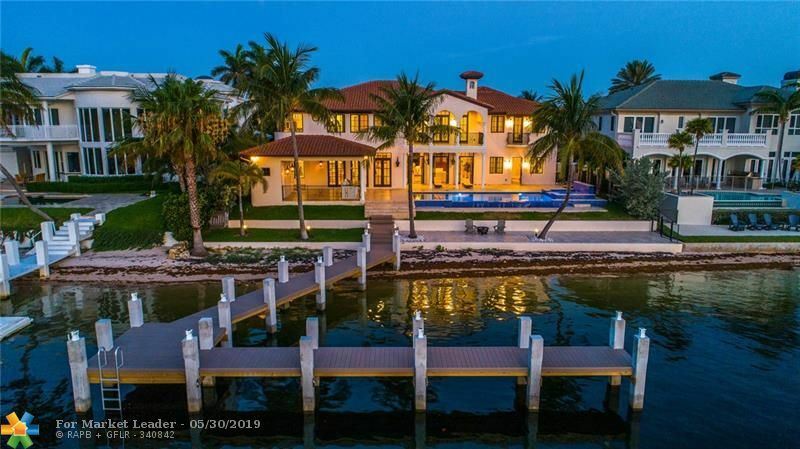 Newly refined, 180' deep water luxury estate & attached landscaped lot presides over the South Grand Canal in the desirous Venetian Isles of Lighthouse Point. This generous residence boasts 4 bedrooms (potential to make 6 bedrooms) 5.5 bathrooms w/ living space featuring picturesque views from nearly every room. Completely remodeled & updated in 2014, this smart home reflects its elegant design, neutrality & quality throughout. The Office/Movie Room, billiard room, massive eat-in chef kitchen, full wet bar, elevator, private dining, indoor/outdoor gas fireplaces, spillover spa w/ deck jets & multi-colored lights sets the tone for a great entertainment lifestyle. 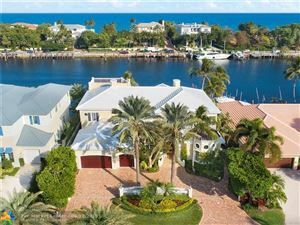 A Rare find, this prime waterfront estate presents an undeniable opportunity to redevelop & create your dream property. New Classic Coastal Style home with stunning long water views designed by award winning Interior Designer, Bridget Conway of Lighthouse Interiors and Architect Randall Stofft. Both have created livable spaces, ideal for the South Florida lifestyle with accents of cohesive color pallets. Amenities include; 5 bedroom, 6.5 baths, club room, loft entertainment area, elevator, wine room, wet bar, amazing kitchen and master suite. Gorgeous pool and unbelievable outdoor entertainment room with summer kitchen. The amazing views make this home that will delight your most important guests. Just one turn and you are on the Hillsboro Inlet! Stunning Coastal Estate Home Built on a Premium Lot and Great Island Street w/125ft of Deepwater Dockage and Close Ocean Access. Inviting Open floor Plan for All Your Entertaining and Perfect for Everyday Family Living. High-end Gourmet Kitchen with Expanded Dining Area, Outdoor kitchen with Gas Lanterns with A Large Second Floor Balcony Overlooking Endless Water Views. Also Featuring a Large Clubroom with Custom Bar, Beautiful High Ceilings throughout, Sono's System & Much More! Exceptionally Built!! 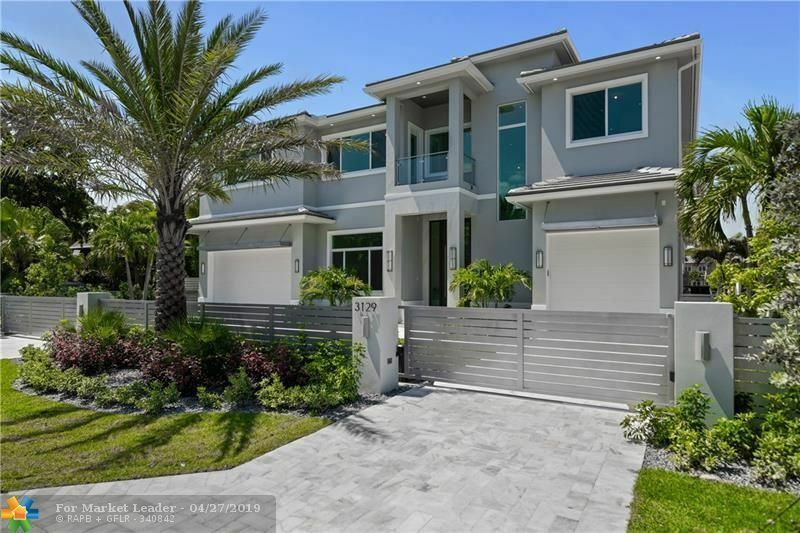 "Brand New" Sleek Modern deepwater estate sited on 90+/- feet of waterfrontage on the wide North Grand Canal by prestigious Strauss Construction and noted architect Randall Stofft. Sweeping views of the wide waterway from every major room including a gourmet chef's island kitchen and luxurious master suite with his/hers baths. Resort-style pool with infinity-edge pool with spa and lanai with fireplace for luxe living and entertaining. Enjoy yacht dockage off the ICWW and minutes to the Hillsboro Inlet. 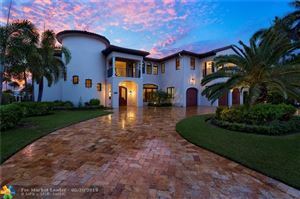 Unrivaled Intracoastal Estate under $4Million! From Palm Beach to Miami, this is a rarely available, direct Intracoastal estate on the most coveted stretch of waterway across from the Hillsboro Mile mega-mansions. In this spectacular location sits this 5 Star, Key West style home, meticulously designed and maintained with 5 bedrooms and 8 baths. Every detail complements the waterfront vistas: from the large, impact windows, balconies (including "widow's walk") and covered patio, to the summer kitchen. Extras include selective stone and hardwood floors, his/her master baths, exercise room, home theater, gated entrances, 3 car garage, full house generator, and much more. 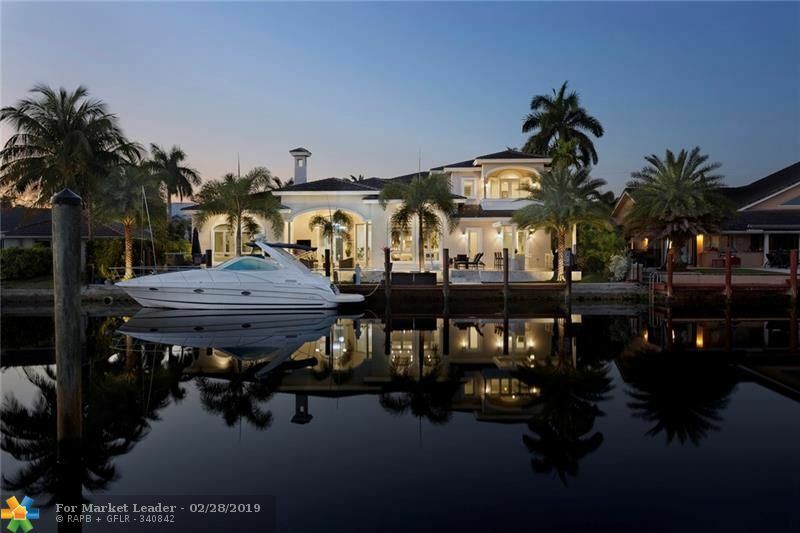 In a No Wake Zone and minutes to the Hillsboro Inlet, this home is a must-see for any avid boater or fisherman! Welcome to this gorgeous Island Coastal home , custom designed and built by one of the area's best builders, this home is extremely desirable because of its amazing location. Featuring over 7000 Sq. Ft. under Roof, with spectacular Intracoastal & beach views in the front. 100ft of protected yacht dockage in the back just seconds to the Inlet...truly paradise! 5 ensuite bd's, huge great rm with sprawling gourmet kitchen & bar, exquisite ceiling designs compliment every room. Step into the resort style pool/spa w/rock waterfall, entertaining summer kitchen & bbq. Hand painted murals inside & out enhance the tropical experience. 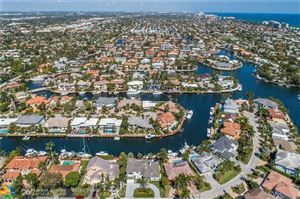 Coastal Chic Deepwater Estate on the wide North Grand Canal sited with 135+/- of water frontage facing the prestigious Lighthouse Point Yacht Club & Marina. Verdant and manicured landscaping introduces this sprawling single-level transitional designed residence with a clean modern flair throughout. Expansive Resort style south facing pool patio with grand entertainment lanai. Fully Equipped Yacht Dock. Shown by appt. only. 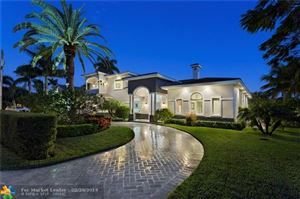 EXQUISITE 5-STAR CUSTOM WATERFRONT HOME IN DESIRABLE LIGHTHOUSE POINT - 105 FT ON THE WATER, CORNER LOT & OVER 5000 SQ FT OF LIVING SPACE! 5 EN-SUITE BEDROOMS (2 OWNER SUITES GÇô 1 ON EACH FLOOR), 5.5 BATHROOMS, PLUS A LOFT. MASSIVE PROFESSIONAL ITALIAN KITCHEN. STUNNING CUSTOM FEATURES & MATERIALS THROUGHOUT THE ENTIRE HOME GÇô DESIGNED BY PROFESSIONAL INTERIOR DECORATOR. NEW EXOTIC INFINITY EDGE POOL! BRAND NEW POURED CONCRETE DOCK & SEAWALL. 3 CAR GARAGE. UNLIKE ANY OTHER HOME GÇô TRULY A MUST SEE! 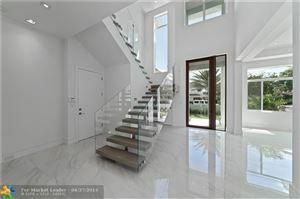 Absolutely magnificent home located on one of the closest streets to the Hillsboro Inlet and Atlantic Ocean. Stunning views with 100ft new travertine dock as well as a brand new resort-like pool, spa and summer kitchen. This 6 bedroom, 5 1/2 bath home has an ultra-luxury master suite with sitting area and private balcony, gourmet kitchen with butler's pantry, home theater and elevator. The home is surrounded by lush tropical landscaping and has a brand new pool and brand new dock! Nothing to do but enjoy! 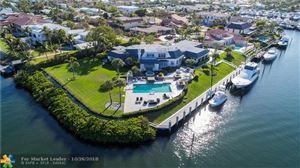 Rare Intracoastal Estate sited on 100GÇÖ+/- of waterfrontage overlooking the iconic oceanfront estates of Hillsboro Mile. A rare opportunity to build your dream estate on this trophy intracoastal property. Adjacent north point lot (MLS: F10114184) can be purchased and combined for a total of 502GÇÖ+/- of waterfrontage and 1.39+/- acres (60,596+/- SF) for the ultimate waterfront setting. Bring your most discerning buyer or developer. Existing structure being sold as-is. Contemporary Deepwater Estate sited on 98GÇÖ of waterfrontage on the wide Flamingo Canal capturing spell-binding views. Open floor plan with gourmet chefGÇÖs kitchen featuring all luxe, stainless steel appliances. Desirable first floor master suite with modern luxe bathroom and soaring ceilings. Three additional bedrooms on the first level all with en-suite baths. Expansive resort-style heated pool with a summer kitchen and SS Gas Grille. Other amenities include marble pavered driveway and pool patio and second level theater room. Yacht dockage only minutes to the intracoastal and Hillsboro Inlet.